Every so often, the advances by scientists and engineers come together in a enchanting way. 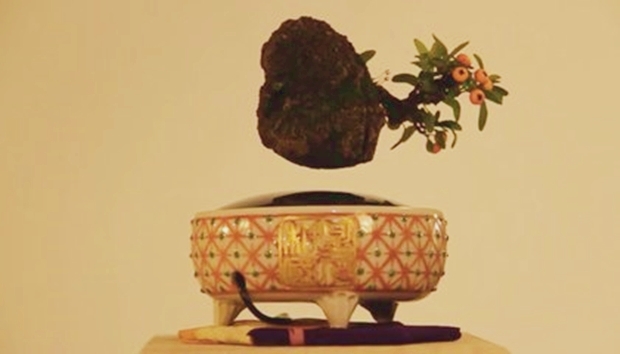 That’s the joy behind these floating miniature bonsai plants, now something you can actually purchase from a new Kickstarter campaign: Hoshinchu Air Bonsai Garden. The Japanese workshop, or atelier, is based on the country’s southern island of Kyushu. The floating plants grow out of a ball of moss, which the workshop calls a “little star.” In Japanese, the moss-wrapped ball of soil used to nurture a plant is called a kokedama or Air Bonsai and is apparently a new craze, which opens up many new possibilities for creative gardeners. How does it work? Magnets, of course. The “little star” has an embedded magnet that enable it to float two centimeters above the base, which in turn carries its own magnet, powered by an AC adapter. The basic kit includes an elegant, simple base and a fabric cushion in addition to the “little star” moss ball. Hand-crafted porcelain bases come at a higher price. Since live plants run into exportation issues, the sets that will be sent out of the country cannot include Japan-grown bonsai. The workshop is partnering with plant growers in the states to supply locally-sourced pine trees, Emily Reynolds reports for Wired.co.uk. Though seemingly magic, these little floating plants aren’t without their challenges, points out James Vincent at The Verge. Watering will be a challenge (the creators recommend removing the plant from its mid-air perch for the operation) and the magnetic base needs to be plugged in to work. Of course, the real challenge with these alluring displays will be keeping the plant alive. Bonsai plants are notoriously tricky to grow, requiring precise application of techniques like pruning, wiring, defoliation and grafting. Whether arriving on a gentle breeze or a stiff gale, air moves like water responding to high and low pressures around the Earth. Wind is an ever-present force. From a gentle breeze to a cold arctic blast, it is constantly shaping the landscape and the weather. But where does wind come from? Simply put, wind is the motion of the air around us, generated by differences in pressure in the Earth’s atmosphere. Air is a fluid, and just like water, it obeys the laws of fluid dynamics. It will seek to flow from a region of higher pressure to one of lower pressure, says Chris Maier, a meteorologist with the National Oceanic and Atmospheric Administration’s National Weather Service. Earth’s air-filled atmosphere is constantly but unevenly pressurized, with highs and lows at various places caused by the uneven heating of Earth’s surface by the sun. The air at the North or South Pole is colder and denser, while the air at the Equator is warmer and rises more easily. The colder, more highly pressurized polar air is constantly trying to move down to the Equator to replace the warm, rising air. That creates Earth’s overall global circulation, says Maier. There are wind belts that circle the planet along latitudinal lines, each having particular characteristics and creating specific weather patterns. One of those bands is the Intertropical Convergence Zone near the Equator, where the trade winds meet. 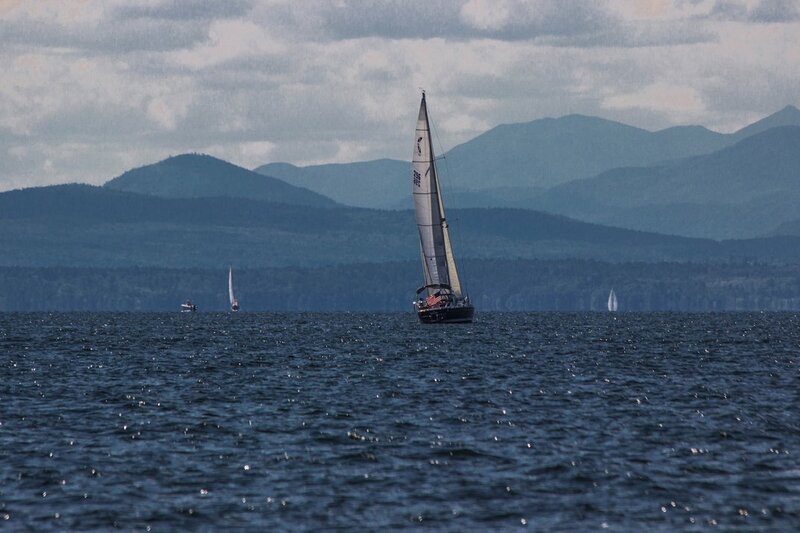 Sailors named the trade winds, navigating by them because of their fairly dependable behavior. Designer Arturo Vittori says his invention can provide remote villages with more than 25 gallons of clean drinking water per day. In some parts of Ethiopia, finding potable water is a six-hour journey. People in the region spend 40 billion hours a year trying to find and collect water, says a group called the Water Project. And even when they find it, the water is often not safe, collected from ponds or lakes teeming with infectious bacteria, contaminated with animal waste or other harmful substances. The water scarcity issue—which affects nearly 1 billion people in Africa alone—has drawn the attention of big-name philanthropists like actor and Water.org co-founder Matt Damon and Microsoft co-founder Bill Gates, who, through their respective nonprofits, have poured millions of dollars into research and solutions, coming up with things like a system that converts toilet water to drinking water and a “Re-invent the Toilet Challenge,” among others. Critics, however, have their doubts about integrating such complex technologies in remote villages that don’t even have access to a local repairman. Costs and maintenance could render many of these ideas impractical. Other low-tech inventions, like this life straw, aren’t as complicated, but still rely on users to find a water source. It was this dilemma—supplying drinking water in a way that’s both practical and convenient—that served as the impetus for a new product called Warka Water, an inexpensive, easily-assembled structure that extracts gallons of fresh water from the air. The invention from Arturo Vittori, an industrial designer, and his colleague Andreas Vogler doesn’t involve complicated gadgetry or feats of engineering, but instead relies on basic elements like shape and material and the ways in which they work together. At first glance, the 30-foot-tall, vase-shaped towers, named after a fig tree native to Ethiopia, have the look and feel of a showy art installation. But every detail, from carefully-placed curves to unique materials, has a functional purpose. The rigid outer housing of each tower is comprised of lightweight and elastic juncus stalks, woven in a pattern that offers stability in the face of strong wind gusts while still allowing air to flow through. A mesh net made of nylon or polypropylene, which calls to mind a large Chinese lantern, hangs inside, collecting droplets of dew that form along the surface. As cold air condenses, the droplets roll down into a container at the bottom of the tower. The water in the container then passes through a tube that functions as a faucet, carrying the water to those waiting on the ground. Using mesh to facilitate clean drinking water isn’t an entirely new concept. A few years back, an MIT student designed a fog-harvesting device with the material. But Vittori’s invention yields more water, at a lower cost, than some other concepts that came before it. 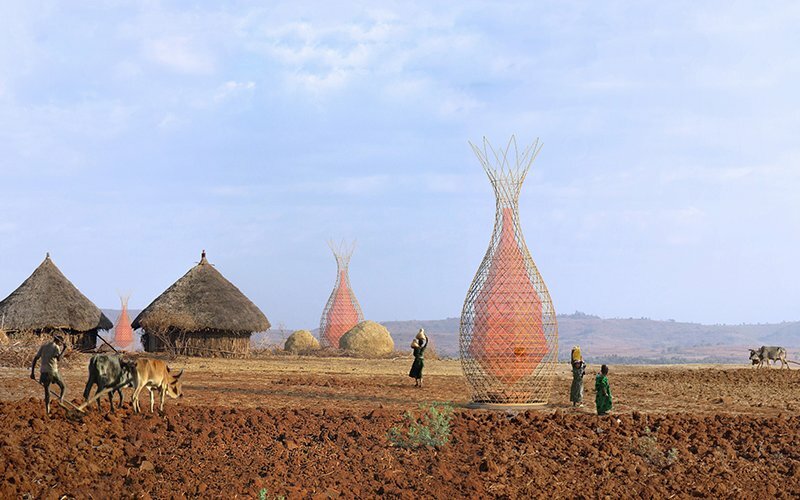 So how would Warka Water’s low-tech design hold up in remote sub-Saharan villages? Internal field tests have shown that one Warka Water tower can supply more than 25 gallons of water throughout the course of a day, Vittori claims. 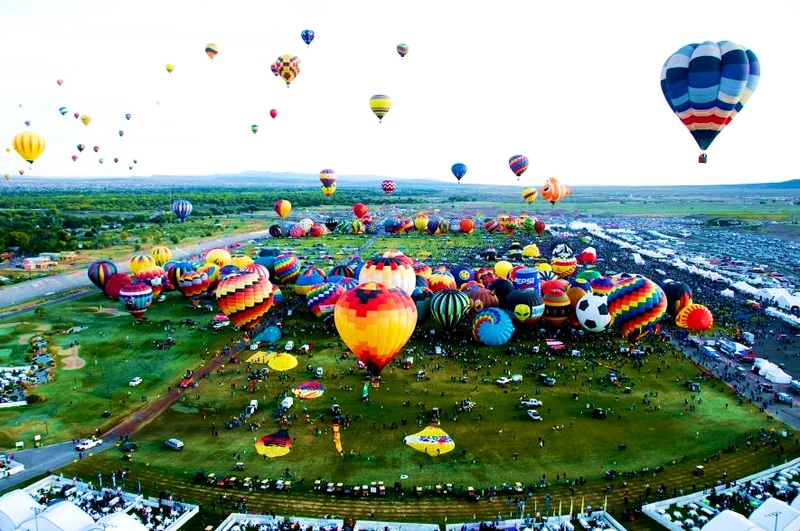 He says because the most important factor in collecting condensation is the difference in temperature between nightfall and daybreak, the towers are proving successful even in the desert, where temperatures, in that time, can differ as much as 50 degrees Fahrenheit. In all, it costs about $500 to set up a tower—less than a quarter of the cost of something like the Gates toilet, which costs about $2,200 to install and more to maintain. If the tower is mass produced, the price would be even lower, Vittori says. His team hopes to install two Warka Towers in Ethiopia by next year and is currently searching for investors who may be interested in scaling the water harvesting technology across the region. “It’s not just illnesses that we’re trying to address. Many Ethiopian children from rural villages spend several hours every day to fetch water, time they could invest for more productive activities and education,” he says. “If we can give people something that lets them be more independent, they can free themselves from this cycle. Believe it or not, there are still things in life that feed the mind and soul and are free. And no, I’m not talking about the beach. I’m talking about Balboa Park, and if you’ve never stepped foot in any of the Park’s wonderful museums and art galleries, well, you ave no excuse not to. Because I’m gonna let you in on a little secret: you can get in for free. Yes, I said FREE. As a public service to San Diego, most of the Park’s museums and galleries offer free admission on Tuesdays every month. Now, as a disclaimer, not every venue is free each Tuesday: the Park rotates them on each Tuesday, so certain museums are free on certain Tuesdays of the month. Also, be forewarned, the free admission typically applies only to the venue’s permanent collections, not any special event, attraction or exhibit which may be in process at the time of your visit. Normal museum prices in effect. Note: Some museums may offer complimentary admission to their permanent collections only and charge admission to special exhibitions or films. Strollers are NOT allowed in the San Diego Natural History Museum during Residents’ Free Tuesdays.